This post is overdue because finding the time to sit down and finish it has been hard. I won’t lie, 3 kids and procrastination were the key to this delay. That’s said this piece would never have happened without the help of Spoke Gallery. I’ve been trying to get Kelsey to do a piece for the kids for a while now and looking back now, Paley was probably too young of a subject at 8 or 9. Working with Kelsey was such wonderful experience. We are truly love this piece and it’s been hanging now for over 3 months. The consensus of everyone who has seen it, is they love it. Paley herself loves how grown up she appears in the piece. Something she continues to strive for but her young heart keeps her real. This is certainly an artist I would like to work with again and I think a 10 year old Margot would be an amazing comparison with Paley’s piece. I’ve also included in this post, photos that the framers posted on social media of the framing of this piece. As we have done this process of working with artists on commissions. The whole social media portion of this process has blossomed greatly over the 10 years we have been commissioning these pieces. I’ve been capturing this social media information over the years and I’ve seen the progression in the number of “likes” and even with an increase in the artwork being shared. This piece is now one the most exposed pieces in our collection on social media. If you had asked me 8 years ago how I felt about this, I would freaking out. My relationship with social media has been a roller coaster ride for over 10 years now. Back then I would have been extremely uncomfortable with images of our kids being on social media without my control. I am happy to report Ive learned to see the value of pieces like our commissions being shared. Its valuable for the artist to get their work out there and help them with getting new clients and new galleries. For me as a collector, the piece’s being shared on social media allows our privately held piece have a public face outside of the artists studio and a gallery. What I truly love about this piece and what I have stressed so much with so many of the artists over the years, is how much Kelsey kept with her artistic vision of Paley. 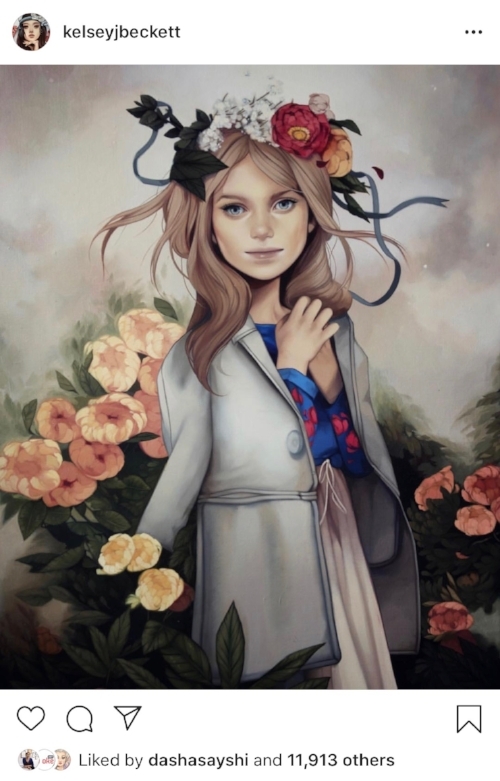 While there is some glimpses of Paley in that amazing Beckett face, the overall look of the piece screams Kelsey Beckett. This piece is not our first Beckett piece in the collection. My first piece was a print and then about a year before this piece came into the collection, we grabbed this amazing piece Beckett did for Spoke Gallery show. The lemons just screamed at me. What amazing about this piece is how striking the color stands out. Very similar to the colors used in Paley’s piece. Thank you Kelsey.